Inbox, as it said on the website, “The inbox that works for you”, didn’t say it can replace Gmail, which means, Inbox as a pet of Gmail, can help with more than just viewing emails. In most of scenarios, Inbox works better than Gmail. It does hit some pain points. In some way, for Inbox, every email carries the capability of task information. That is to say, every email we receive can be a task, especially for working. For instance, Kellie sent me an email to ask me to update my progress. Estee told us to come to the thesis review on Friday. Scott sent us a bunch of viewpoints to read. Those are all tasks I need to execute. Inbox provides a good service for managing emails. Take myself for example. I’m not the person who will archive emails, which cost a lot of time and unnecessary energy for me. I’ll keep important information in my mind if it is truly important to me. And I suppose that the email I forget might not be important enough to me. Or it doesn’t matter if I forget the thing. 1. The bigger screen people get, the more possibilities people want. Combined with To-do list, Inbox categorizes every email automatically and helps users to manage their task based on emails. This works for Inbox as an app. People love to manage their tasks on mobile phone rather than website. So the webpage version of Inbox doesn’t work good. The loose structure and layout cut down necessary information for users. Gmail webpage tries to display as much as information it can, which is reliable for users. As people want to get more details when they are using computer rather than mobile device. The bigger screen they get, the more possibilities they want. They want to make sure the product has every function they want, not only just show the important functions. 2. People have better understanding about interactions in mobile platform. Inbox merges some detail interactions but still recognizable. When it’s loading the email, the avatar part will show the loading status. And the designer combined composing function with other actions, like invitation, sending email to recent contacts. As a mobile app, those details make Inbox simpler and easier. A few years ago, designers are trying to make an app like the website. But now, people are getting used to specialties of mobile platform. They recognize the status by motions, icons, and interactions, not totally rely on the position and layouts. While for webpage, again, the screen is bigger, they are afraid to find things that will appear in different places. Sometimes, not all the time, fancy interactions for webpage will cost more loading time and unnecessary attentions, and more time to develop that fancy effect. Especially, people concern more reliability when they are using webpage. I think with the development of mobile platform, new behaviors will form, and technical problems will not be a problem. And then, more interactions can be transferred from mobile to the web. 3. More scenarios, more possibilities: Traveling and Online Shopping. 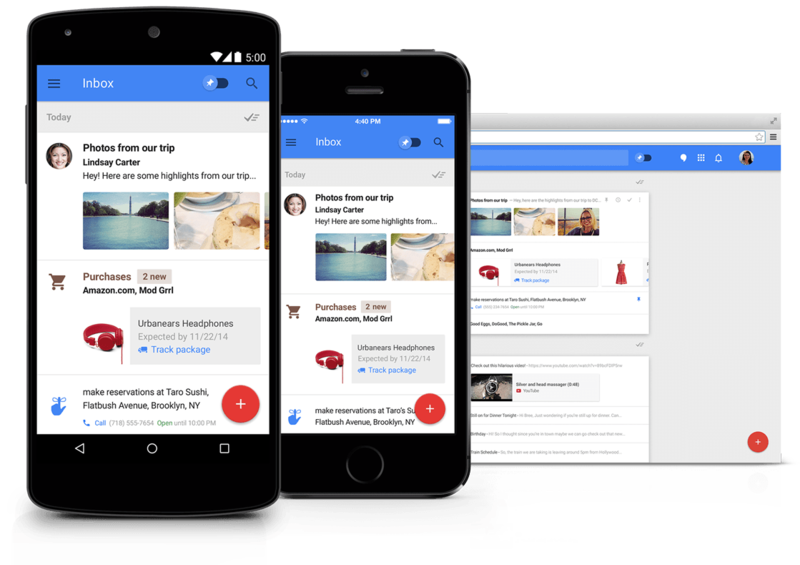 Inbox provides us a good way to redefine a product, not just rearrange the information we have. What designer needs to do is thinking about the scenario of using this product. When people are using Gmail, what they usually do? For work and task purpose, Inbox is a very good solution. As pets of Gmail, Inbox can have more brothers for other scenarios. Another scenario can be travelling purpose, when people are looking for places to go and searching for flight tickets. I remembered when I planned for the trip to Taiwan, I need to do a lot of work to settle down places to live in different cities. And I need to talk with hosts who can provide a room for me. I also need to calculate time and arrange the whole travel route. For this scenario, Inbox can be a traveling management app. Or thinking about online shopping, as many people have more than one account for registering shopping accounts and receiving discount information. Inbox can be a shopping helper to gather all the sale information and help people to track their packages. So we don’t really miss out the huge sale we love and don’t need to mine the tracking number in the huge amount of emails. Inbox can be smarter. For example, helping user to define which group email is related to the user, and which email is related to one affair. I have the experience that one email was buried for a long time and I didn’t know that I needed it at that time. After I need that, it was late. Sometimes, this kind of emails are group notice. People tends to not pay enough attention if the email is sent to many people. Or sometimes, the sender suppose the email is related the group of people and they will decide themselves. But for users, there are some other reasons they don’t need to pay attention to the group email. They don’t need that. Inbox can do more based on the users personalized needs. Thus, I remembered the personalized central control system for home in Black Mirror 2014 Christmas version, named White Christmas. They copied the mind of a person and put that into a control machine to force that personality to work for the user. It becomes the most highly-personalized controller as it is an independent and same mind of the person herself. What Inbox can do as a smarter tool? Maybe analyzing every sentence you’ve sent, every expression, tracking all the activities, learning your behaviors to come up with how you write email, what you are interested in, who you like, when you have time. Imagining the future, when I say”Gmail, reply Wendy’s email” to Siri. Then, Inbox composes an email and writes “Hi Wendy, Thanks for your email! Blablabla…” It’s kind of creepy to let a machine learn a lot about deep things and behaviors of us. But it’s interesting to see how people let technology to do whatever they want.